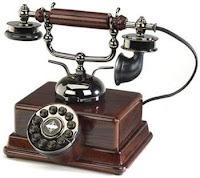 This sounds like a great idea, you can have your number redirected to any device, PC softphone, Mobile, Desktop handset even a hotel phone if you're away for the night. The idea is that you have one number, assigned to you, no matter where you are in the world. It's a big concept to get your head around, you no longer need to be tied to a desk, you don't need to pay hotel charges to call out as the hotel phone essential becomes your phone. All charges are made back to your company and the whole system is seamless. So, the big question is, how do you tell people about this?! For people who spend all day at their desks they won't notice the difference other than a shiny new handset. But, for people who are more mobile there are real advantages, the issue being though that there are more things to remember! If you're away from your desk or in a meeting what should your phone do? It can point to your mobile, it could go to your voicemail or it could go to someone else. But you need to tell it to do that and that needs to happen via a long push button system on the phone or via a web browser. So now we have a web browser controlling your phone and how do you explain that to someone not familiar with the concept? As you can see, there are a lot of questions to be answered and explained in the easiest way possible... time to put our thinking caps on and pull in all of our resources, this could be a biggy! I finally received an email from bitly.pro (beta) this morning about our account being created, all very exciting stuff! Genius stuff, nicely on brand but not too heavy handed and means we can get some feedback on link traffic from a central account. I just need to nominate a member of the team to handle the short url requests! Ideally we would like an in-house URL shortening service but due to the timeframe for this to be implemented we have looked at an external alternative for the time being. We can always move over to the in-house option once it's up and running with an alternative domain name and then phase out the uob.im links. A bit of a pain but at least we can use the services now! Yet another external product to enhance our offerings in Marketing, anyone else have 'timeframe' issues with development work? Mobile devices... should we be worried? 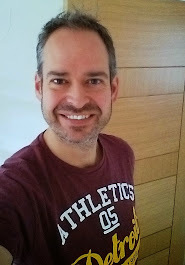 I read an interesting posting by Mike Nolan at Edge Hill University about the use of mobile devices to view their website. So, in the interests of sharing information I thought i'd not a similar exercise for us! 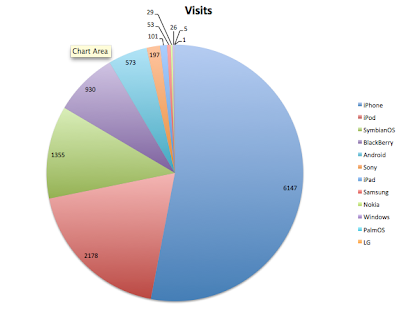 I've matched the dates used to run the report, 14th April – 13th June 2010 and included the resulting pie chart stats of unique visits below. What you might notice is that we are also seeing a large number of visits from iPhone and iPod users to the website. In fact, the only really difference seems to be that we have more SymbianOS users, probably due to our selection of company mobile phone more than anything else. So, i've finally created a Twitter account for us to keep track of snippets of info we find interesting! The feed is streamed onto the blog (below right) but you can also follow us to kepp up-to-date! A quick posting about a video being played on the Royal Society for the encouragement of Arts, Manufactures and Commerce (RSA) website as part of a series of animations. Professor Zimbardo conveys how our individual perspectives of time affect our work, health and well-being. Interesting subject in itself (153,000 views and counting!) but it's the video representation of the talk that really held my interest, well worth a watch and if you like this one then the rest of the series is available online at the RSA Blog.